With Shields he bade the war-wall be formed and the troop hold against the foe. When doomed men were to fall here. 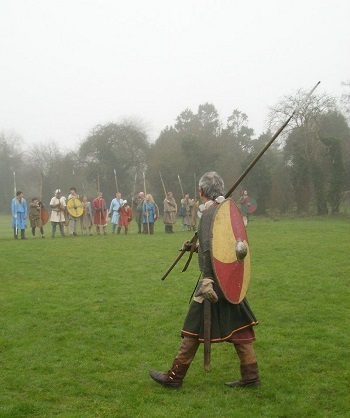 Regia Anglorum also specialises in combat re-enactment, the same stringent rules regarding authenticity being supplemented by on-going weapons training and inspections. Our awareness of safety is high and it is the only matter which takes precedence over authenticity in our work. The structure of public performances is deliberately arranged so as to inform whilst entertaining. 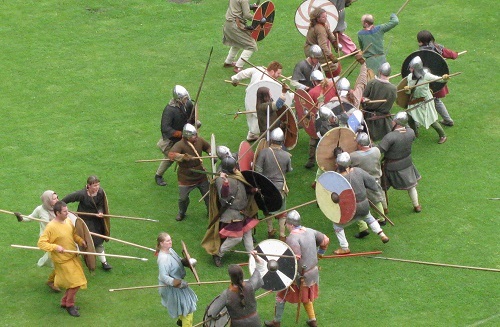 Almost all our combats are open-ended and we do very little scripted fighting. This enables our field commanders to use real tactics in real-life situations, adding a tremendous frisson to the life or death feel of our military re-creations. One of the perfectly justifiable concerns expressed by new members is in respect of battlefield safety. Certainly, if one stands back and watches a re-enactment display, it is often hard to see how people get up at the end of the battle and are not all carted off to hospital. And that is how it should seem to the observer. It should look, sound and smell dangerous – but in fact be comparatively safe. Many members join purely to be part of the fighting arm of the society. Firstly, it needs to be pointed out that realism is not as important as safety on our battlefield. We do everything reasonably possible to identify and reduce the risk of combat. Regia’s military combat displays are considerable less dangerous than most active team sports. Activity on the battlefield is controlled by the National Training Officer, his deputies and the War Council. The Master-at-Arms is responsible for regulating and authorising the weapons used for combat. You’ll be trained to use each weapon safely at your local battle practices, national training events and training sessions at major shows. Please talk to your Group Leader, Training Officer and Master-at-Arms and/or Authenticity Officer before making or purchasing any weaponry. They will advise you on what to do. All weaponry is inspected by the National Master-at-Arms and his deputies prior to every day’s combat. All weapons are steel replicas but have blunt edges and safe points. In particular, swords and large knives (known as seaxes) must be fashioned from tempered, sprung steel to avoid dangerous breakages. Specific requirements are available in the Master-at-Arms’ regulations, if/when you need them. The society has an established training policy that is under constant scrutiny and is regularly revised where necessary. Our general outline policy has not changed much since our inception in 1986 and revisions and changes have always been of detail and intended to refine rather than entirely change. 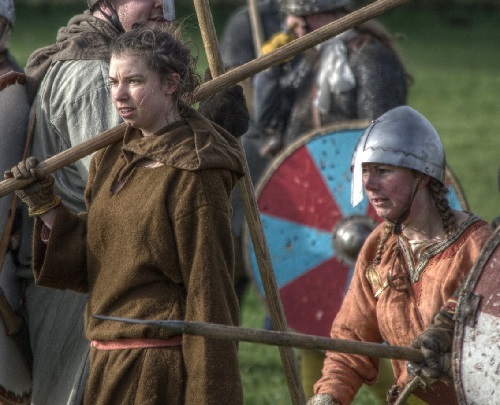 We are founder members of the National Association of Re-enactment Societies (NAReS) and our rules at least follow the guidance notes that are issued by that body from time to time, but usually exceed them. We hold formal training sessions at nearly every society event, during which members are taught and their skills examined. Members under tuition must attend such practices if they are present at an event. A number of rubber stamps are used to mark the membership document of every member as they progress in their training. (For details of this, look at the Master-at-Arms and Battlefield Guidelines, or ask your Group Leader). All warriors proceed via the training schedule which ensures that they learn how to fight in a safe manner. This does not mean that combat is boring however. From the simple rules that they learn, they can develop their abilities and individual styles. Nearly all fighting is competitive, and any contest is only decided by the skill, and sometimes luck, of the combatants. The first weapons that a new member learns to use are the spear and knife, and others may be added as the warrior becomes more experienced. Despite our competitiveness, Regia’s safety record is first class. Although the occasional bruise or graze may be suffered, it’s a great deal less hazardous than playing rugby. In normal, combat life, or death, is decided by the weapon contacting the enemy. That contact is not, in the usual way of things, overly hard and we as members, and as a society, go to considerable lengths to ensure that the environment in which these weapons are used is as safe as it is possible to make it. Occasionally, with the best will in the world accidents can happen amongst the most highly trained and experienced people. It is impossible to make the kind of combat that we undertake entirely safe and if this is a personal criteria for your becoming a member of our society, then I must regretfully inform you that this hobby is not for you. It is a condition of membership that each person accepts the risk of injury when they decide to join Regia Anglorum. In our Constitution we say this “In respect of members’ liability, the Society, its officers and/or members cannot be held responsible for any injury, loss or damage occurring to any member or their property. In particular, it is the business of each and every member to investigate, research and understand the specific risks that they may encounter in re-enactment and to decide in cold and sober judgement whether or not they wish to involve themselves in the taking of such risks. Anyone taking part in any of the activities arranged by the Society will be deemed as having taken such a decision by their attendance and participation. It was to all intents and purposes unknown in Regia’s period of interest for women to take on military responsibilities. But we understand that we are not really Saxons and Vikings, but a twenty-first century club. We accept that all our activities should be open to both men and women and that, where possible, every member should be able to take part in all our activities. Therefore, we make no differentiation between men and women on the battlefield, all we ask is that women should make the effort to look, sound and act as much like men as possible in order to enhance the overall appearance of the battles we re-create. This is a specific concession for arena events and anyone living, working or just lounging about on the Living History Exhibit will be expected to dress according to gender. Although Regia’s period of history might not invoke such romantic images of the archer as do the later mediaeval years, the bow was an important weapon, and an even more important hunting tool. We therefore include archery within our military displays. It does not form part of the actual battle but is a separate item, using human targets! The arrows used have rubber ends to them, and all targets are armoured and fully trained. 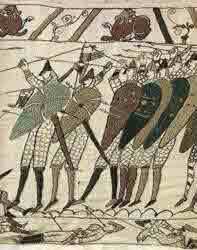 Archers wishing to take part in combat displays have to pass a rigorous test set by the Missiles Officer. Some shows include archery competitions where the non-combat archers can show off their skills (including women dressed as women). Bows must be of the right design and poundage before they can be used at a Regia event, and must be inspected first. If you are interested in archery then contact the Missiles Officer.